formulated for the cleaning all types of Road Bikes. .
Our Road Bike Cleaner will wash, wax and remove oil/grease from your Motorcycle all in one application, leaving your bike spotless. 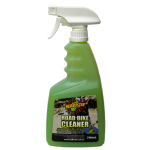 MudBuster Road Bike Cleaner is a natural based product and yet performs to the highest levels when it comes to motorcycle cleaners. It activates when mixed with air and water to eradicate even the toughest dirt and will leave your bike shining when polished with a micro fibre cloth, thanks to its wax content.